Apple on Friday issued an ultimatum to Adam Howell, developer of sticker pack "Phoneys," saying he must fundamentally change the content of his top-selling iMessage App Store title or face removal. Detailing the chain of events that led up to today's warning, Howell in a Medium post said Apple contacted him shortly after "Phoneys" skyrocketed to become the top paid and top grossing offering in the iMessage App Store. 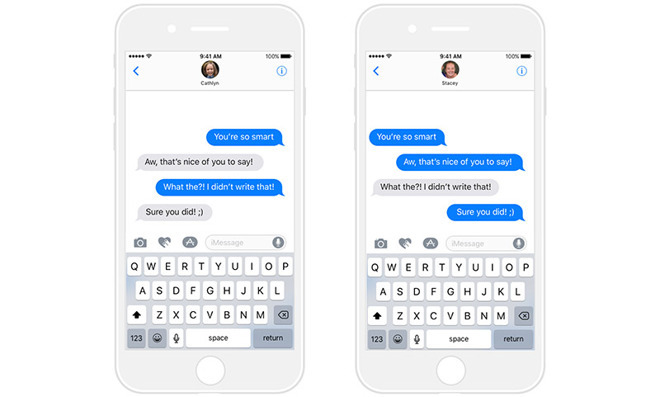 A clever idea, "Phoneys" contains a set of stickers designed to mimic Apple's trademark blue text bubbles, the same graphic that shows up as a sent message in Messages. Each bubble contains a flattering or self-deprecating phrase and can be placed over a friend's —or enemy's —message in a conversation. As Howell puts it, "Phoneys" lets users "literally put words in other people's texts." The sticker pack comes with 28 phrases, including "You're so smart," "My political views are totally wrong," "Your sports team is better than my sports team" and fan favorite "Oops I just pooped myself." Apple approved the app last Friday. Launched on Monday, "Phoneys" gained notoriety a couple days later when Mike Rundle mentioned it on Twitter. The app was featured in a Wednesday TechCrunch post, which was subsequently re-blogged by John Gruber. Howell's sticker pack is obviously designed to let iMessage users have a bit of fun with their compatriots, but Apple's lawyers —unsurprisingly —think different. To Apple, "Phoneys" is a "prank" app, something not acceptable for sale on the App Store. The company gave Howell one week to rectify the situation. Stickers in "Phoneys" can no longer be green or blue, must not use the San Francisco typeface and the software itself is not to be marketed as a "prank" app. The text bubbles also need to be redesigned to resemble something along the lines of "comic book cartoon bubbles." If Howell does not comply by next Thursday, "Phoneys" will be yanked from the iMessage App Store, ending the project and effectively shutting down any potential future income. On the other hand, the developer can bend to Apple's demands and change the app, though users who already paid a dollar for the humorous text bubbles might view the move as a bait-and-switch. There is one alternative Howell failed to mention. He could, theoretically, not comply and stick with his original idea —arguably what people are paying for —continuing sales until the Thursday deadline. Following removal, he can then relaunch the app with Apple's suggested modifications under a different name. Though it would mean losing an enviable spot in App Store rankings, the decision would keep happy those customers who pushed it to No. 1 in the first place. Just an idea. "Phoneys" is available to purchase from the iMessage App Store for $0.99.